Although being asleep at the wheel of a car is a situation that wants to be avoided – especially if it’s moving along at the time – it is something that could one day be a not altogether uncommon sight on roads around the world, if scientists at Oxford University have their way. 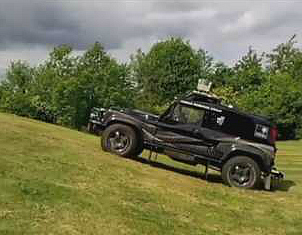 The team of scientists have equipped a Bowler Wildcat car with cameras, radar and lasers to help it “see” the world around it. Project leader Professor Paul Newman told the BBC that the car can drive without any human intervention, and that one day the technology it utilizes could help toward cutting down on road accidents and traffic congestion. Self-driving cars of one form or another have been around for a while – last year Google said it’d developed one which had covered more than 140,000 miles in the US – though Newman’s vehicle differs from Google’s in that it has fewer sensors and relies more on 3D maps of streets. He can even imagine a future where car manufacturers are engaged in an “arms race” as they try to achieve the record for the greatest number of minutes of driving without any human intervention. “You can imagine one company advertising a model of car which, on average, drives itself for 10 minutes a day and then another manufacturer will come out with one that does 15 minutes,” he said. Whether manufacturers manage to make one that allows drivers to get some decent shut-eye on the way home after a hard day at the office remains to be seen.